Until we learn to float around the house, keeping floors spotlessly clean is the number one headache we face when it comes to keeping house. Here are some top tips for cleaning different floor surfaces. Any hard floor will need to be swept regularly, but we’ve all faced the frustration of going over the same area countless times only to find there always seems to be some dust and dirt left behind! That’s where Vileda DuActiva comes in. The bristles gather up dust and dirt on uneven surfaces, and the unique foam layer creates an impenetrable barrier to dust. Perfect for a one-sweep clean on all indoor hard floors. For an in-between fast clean, use the 1, 2 Spray Mop which allows you to control the amount of cleaning solution you put on your floor. The unique hollow handle can be filled with cleaning solution and then sprayed directly onto the floor with the trigger handle. A mop that is always ready to use! Taking care of hard floors – choose the right mop! Ceramic tiles come in a variety of colours, patterns & textures and thankfully need little maintenance to keep them looking great. After brushing, simply mop regularly, in a figure of eight action, drawing the mop towards you for maximum effect and particle pick up. Try the Supermocio or the Magic Mop. Top tip – Sponge mops are super absorbent and the self-wringing mechanism means no additional bucket with wringer is needed. Keep these floors free of grit and dirt particles as they can cause damage by scratching the surface. The use of excess water can breakdown the surface varnish and warp the wood over time so you’ll need to use a product that doesn’t hold excessive water, unlike standard mops. Try a mop with a bucket and wringer, which will ensure you’re not putting too much water on your wood and laminate floors! Having lost its popularity after the 1960s, linoleum has steadily returned as a top flooring option for today’s homeowners. Genuine linoleum flooring has the same characteristics as wood – it’s tough and durable but it must be protected from moisture. Again, choose a mop that doesn’t hold excessive water, such as the 1, 2 Spray Mop. Vinyl is one of the more popular types of floors found in homes, particularly those with children and pets. Vinyl flooring offers the look of ceramic tiles or wood, but can cost up to 70% less. 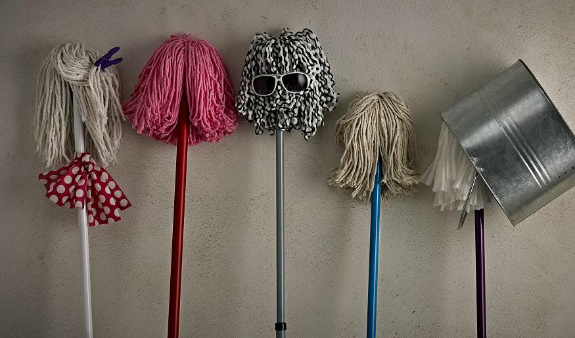 You can use any of these mops on vinyl as it’s tough and durable. We’ve got a great selection of mops, buckets and cleaning products online at Wilko.com and in your nearest store, so there’s no excuse for avoiding those cleaning jobs!